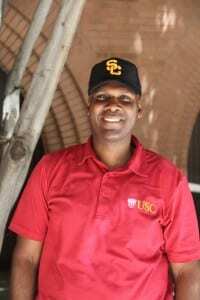 As a student in the Master of Arts in Gerontology Program at the USC Leonard Davis School of Gerontology, Victor Hudson has merged his experience as a clergyman with his passion for gerontology, studying hospice care in order to help ill and older individuals and their families. The entries on Victor Hudson’s résumé are incredibly diverse, but his commitment to working hard and helping others has shone through at every point in his life. Hudson was born in Chicago but grew up in Southern California; as a teenager, he lived just a few miles from the USC campus. Following nine years of service in the United States Marine Corps, Hudson received his Master of Business Administration degree from Regent University in 2001 and began working for the Neuroscience Division of Pfizer Pharmaceuticals, Inc. later that year. There, he learned more about issues facing older adults as he marketed the Alzheimer’s disease drug Aricept and the neuropathic pain medication Neurontin. In the meantime, Hudson had begun following another call to service, this time as a pastor and leadership coach. He served as a clergy advisor for the New Jersey Family Policy Council and developed a leadership course for incarcerated men before earning his Master of Arts in Religion from Liberty Baptist Theological Seminary in 2012. He has been a full-time faith leader and church planter ever since, and he is now completing his MA in Gerontology in concert with his clergy work. Hudson says choosing the USC Leonard Davis School of Gerontology was easy for him. His passion for gerontology and his dedication to serving families as a clergy member have merged into a keen interest in caring for individuals at the end of their lives as well as their loved ones. Upon graduation, Hudson hopes to use his background and his new skills to help others both in the U.S. and around the world.